Paul Strassmann’s blog: How Efficient is the Management of DoD Enterprise Systems? 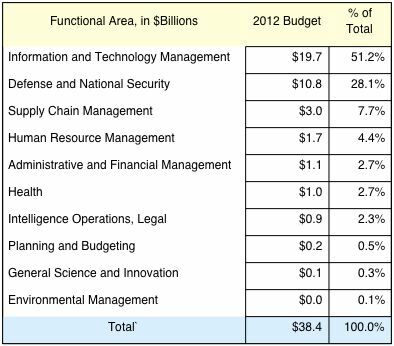 How Efficient is the Management of DoD Enterprise Systems? In March 2012 the GAO delivered to the Congressional Committee on Armed Services a report on Enterprise Resource Planning (ERP) Systems. It included ten systems with total estimated current costs of $22.7 billion [General Fund Enterprise Business System (GFEBS); Global Combat Support System (GCSS); Logistics Modernization Program (LMP); Integrated Pay and Personnel System (IPPS); Enterprise Resource Planning System (ERP); Global Combat Support System-Marine Corps (GCSS); Defense Enterprise Accounting and Management System (DEAMS); Expeditionary Combat Support System (ECSS); Integrated Personnel and Pay System (AF-IPPS) and Defense Agencies Initiative (DAI)]. The ERPs would be replacing legacy systems costing $0.89 billion/year. Replacing such systems would take anywhere from seven to fourteen years. When the ERPs are finally installed they would cost up to $207,561 per user and have a payback as high as 168 years. The primary reason for building the new ERPs is to modernize the interfaces with 560 legacy systems already in place and connecting with 1,217 existing applications to meet changing requirements. The projected payback years exceed the life expectancy of technologies in every case. That makes these investments questionable. The above table above is incomplete. For instance the Navy’s NEXTGEN is excluded even though it is projected to take 11 years and cost over $40 billions. There are also enterprise applications, such as the Defense Integrated Military Human Resources System (DIMHRS), which was aborted after spending over a billion dollars. 1. The project implementation time always exceeds commercial practices. DoD pursues a sequential phase approach for planning, design, coding and implementation, which means that during each phase time-consuming agreements must be negotiated about interfaces. 2. Elongated project duration contributes to rising obsolescence. Program management is continually involved in negotiations about 1,217 interfaces with stakeholders while features are changing. This is increases costs and delays schedules. 3. The costs of every ERP continue rise as the alteration of requirements dictates revisions that propagate well beyond the scope of any ERP. 4. The non-standard user interfaces for each ERP require large investments in training and education. That is excluded from total costs because budgets do not include the payroll of military and civilian personnel. 5. Each ERP system has its own infrastructure. Each obsolete legacy systems must be custom-fitted into the changed ERP. If DoD would adopt a standard Platform-as-a-Service (PaaS) model for every ERP it could offer for all connections a standard application program interfaces. Programs could then interact with the ERPs so that the developers can code sub-systems for connectivity using interchangeable interfaces. The adoption of such approach would materially reduce redundant work, cut costs and allow building of ERP’s incrementally. The current approach to implementing ERPs is not working. The project time line is too long. That can be shortened only by adoption of a standard PaaS environment. To maintain interoperability during the transitions from legacy to new ERP applications the DoD CIO should impose standards that comply with open source formats. This would avoid spending money on tailor-make custom designs. The new approach to the design of ERP software must rely on central direction how all programs can be executed. It also requires control of shared data definitions. Current inconsistencies in data formats impose a huge cost penalty. New efforts to start an ERP would have to be guided by strong direction that guides architecture, choice of cloud software and network design. Without such guidance the current efforts to complete stand-alone ERPs will cost too much and deliver results too late.